I'm going 'old school' for today's Makers' Monday post. Instead of talking about what I'm making, I'm going to show you a few things others have made. In other words, I got lazy. I'm actually writing this late Saturday night because I have to work on Sunday. I know! My "summer" job starts tomorrow. Or yesterday, as you read this. My work schedule will be sporadic days sprinkled here and there for a while, then it will be every weekend, then every day. Anyway, I won't be around on Sunday to type up the post. I accidentally spent Saturday curled up in the comfy chair reading trashy romance novels instead of being a productive member of society. In fact, I was so unproductive, I didn't even knit while I read! So here it is, late Saturday night and I've got nothing of my own to show you. I do, however, have a couple of things I've procured off Etsy recently that I'm super excited about and think you'd also be interested in. The first is Ann Budd's Gauge Ruler from Friends and Fiber on Etsy. How cool is this thing? 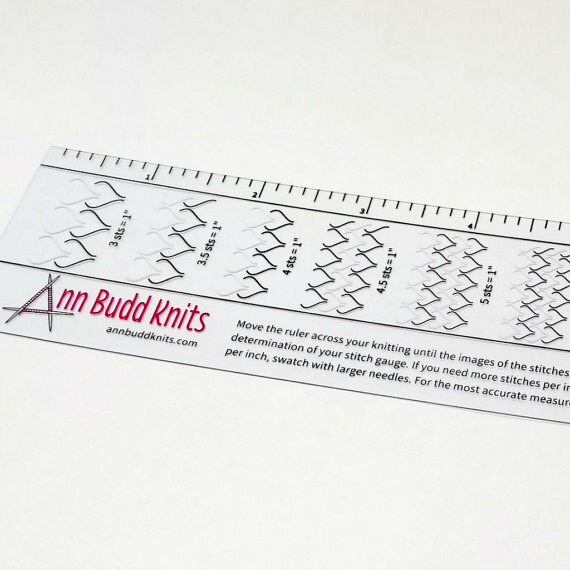 You just lay it over your knitting and match up the stitches on the ruler to your knitted fabric stitches. It's so stinking easy to use! The ruler, besides being an actual 9 inch ruler, measures gauge in half inch increments from 9 stitches to the inch up to (down to??) 4 stitches to the inch. 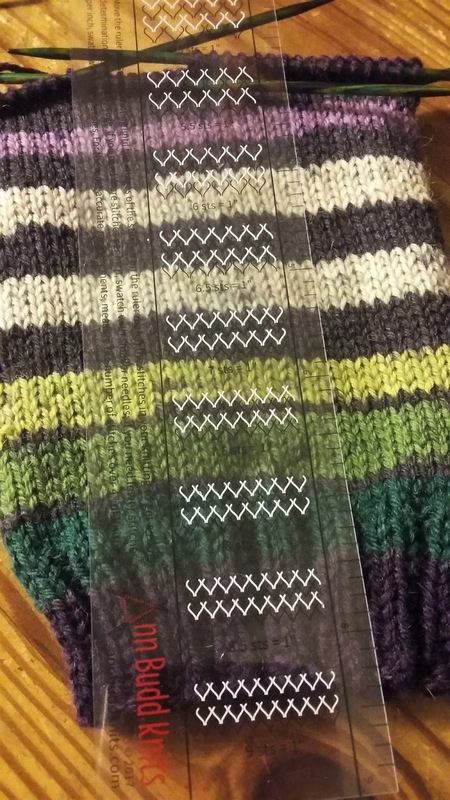 And, if you're like me and tend to refuse to check your gauge even when you have a cool, handy gadget, it also makes a great knitting journal bookmark and bullet journaling straight edge ruler. Oh, and it's also handy for tearing washi tape. Hey! 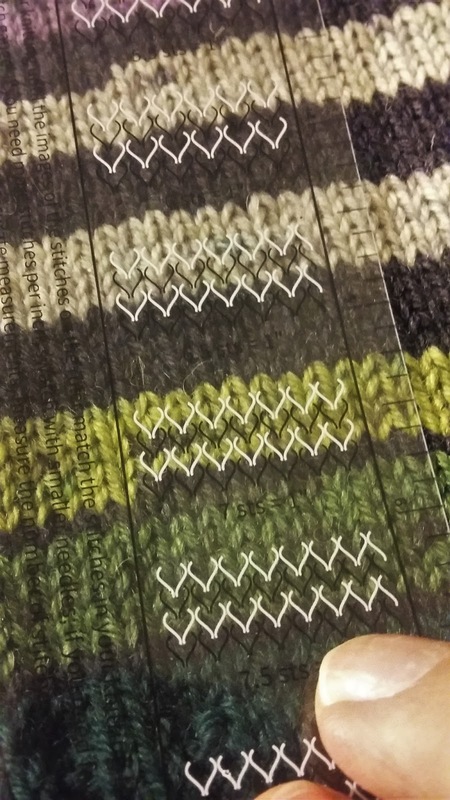 Look at that - a tiny bit of knitting. I'm no where near as far along on my Slytherin sock as I'd hoped to be. And then there's this project bag. I LOVE my new project bag! Actually, I'm not sure I can legally call it "new." I bought it several months ago and you may have even seen it hanging out here on the blog. I use this bag constantly so I'm sure it's probably been in a photo or two. So, yes, I LOVE this project bag. The drawstring closure is easy to open and close and the bag's size is perfect. All my other project bags, and I seem to have collected quite a few, are either several inches smaller, or many, many inches larger. This bag will easily hold a Hitchhiker or two sets of socks yet it's still small enough to cram into my purse. As much as I love my jellyfish bag, I picked a lousy time to show it to you. The shop is currently on"sewcation" so that it can get restocked and ready for spring. I really hope you'll go check them out in a few days or weeks though. I remember having a hard time deciding which bag to get because they had so many adorable ones and the customer service was excellent. The shop's bags are definitely worth the wait. Okay, I think I've rambled on enough. 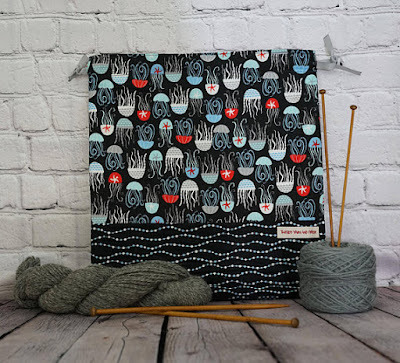 Please join me in celebrating #MakersMonday and also, please know that I'm not affiliated with either of the products I mentioned today - I just really, really like them and thought you would too. My mood affects my gauge so much that it seems pointless most days to bother checking it. I just know that if I'm angry, I knit project A; if I'm happy, project B. It's hard for me to resist a new bag. Yes! I'll admit, I'm a bit of a bag hoarder.